Today I have another Design Team project for all of you! Did you all sign up to follow the eCraft by Craftwell blog? Weren’t the projects last week wonderful? This week the Design Team was challenged to create a project using an image from eCraftCentral.com. If you have not explored eCraftCentral.com, make sure you do! There are a lot of images there available for purchase at a low price! Most images are less than a dollar! For my project, I chose this image which you can get right HERE! Notice that this image comes from the Banner Expressions SD card? This is one of the things that I love about Craftwell and what they are doing with eCraftCentral.com. If there is an image on a SD card that you want, but maybe you don’t want the entire SD card, it just may be available on eCraftCentral.com. How awesome is that? Not all the SD images are available, but there are quite a few that are! I have to tell you that I got carried away with this project! I spent more time on it than I planned, but I just love how it turned out, and my 6 year old says that it is really spooky! To start, I covered an 11”x14” canvas with paper from Echo Park Apothecary Emporium. I ripped up the paper and used Glue N’ Seal from Inkssentials to adhere it down. Next I added some Distress Crackle Paint in Black Soot to the edges. I just love how you can see the paper underneath through the crackle! Now comes the fun part! There is a little hidden surprise on this sign! Can you guess what it is? Take a close look at the picture below! Using images from Lettering Delights doodlebats Jack-O-Patterns, I cut these out of removable vinyl. For all the vinyl on this project, I used a pressure setting of 2 with my vegetable cutting mat, blade cap on, multi-cut off. I placed them sporadically on my sign, making sure that I had enough room for my title. Next I used a new product to paint in my stencils, and I have to say that I am loving this stuff. I used Marta Stewart’s Glow in the Dark Effect from her new paint line (exclusively at Michaels). The Glow in the Dark is available in a few colors, but I just used the uncolored one so that my paper could glow. I added about 4 coats of the Glow in the Dark effect and then very carefully removed the vinyl. This next picture is not the best, and it really does not do it justice, but I hope you get the idea anyways! This is why my son says that this sign is really spooky! But of course, I am not done! I still have to add my eCraftCentral.com title to it! To do this, I decided that I needed to dress it up too! First, I made a shadow blackout layer in eCraftshop Pro using some white vinyl. After cutting that out, I covered it with some glitter paint from Martha Stewart’s new line. This paint is amazing. It works on glass, metal, wood, so I thought why not vinyl! Notice in the picture above how the paint pools on the backing paper. This is a really neat effect. I added 3 or 4 coats of the paint until I got the orange color that I was going for and then I added that onto my sign with the extra paint pooling on the edges. After seeing the surface that the glitter paint left on the vinyl, I decided to cut the black layer out of outdoor vinyl because it adheres stronger. If I had to do this over, I might just do this in cardstock and use a strong liquid adhesive. Some parts of the outdoor vinyl did not stick as well as I would have liked them to and so I added a little liquid adhesive in some spots. The eyes and toes on the owls were also cut out of vinyl. When you get the image from eCraftCentral.com those parts are actually set to draw with the pen. In eCraftshop Pro, this is easy to change to cut instead and that is what I did here. I just love how you can take an image like this and change it around to suit your project! For a low investment, I got a one of a kind stand out title for my sign! To finish the sign off, I used some Halloween embellishments that I got at Michaels and the black chain I got at Ace Hardware. Hope everyone enjoyed this project as much as I enjoyed making it! If you haven’t signed up to follow the eCraft by Craftwell blog yet, by all means do it now! The entire Design Team has projects all week long for you! If you missed my post yesterday, check it out HERE. I had an inquiry about how I got everything so perfectly lined up in the eCraftshop Pro software to make my stencil for my background. What better way to explain it then to do a video on it. It is actually quite easy to do, so here we go! Hi everyone! Welcome my first design team post for the eCraft by Craftwell blog! This is the first week when all of us on the design team will follow a challenge put forth to us! For this week, our challenge was to use the Fundamentals 1 SD card with a Love theme! For my project today, I decided to do a scrapbook layout focusing on a picture that I recently came across of my MIL and FIL posing with my husband. I am guessing that my husband is about 18 months old in this picture. Hope you all enjoyed this project and be sure to follow the eCraft by Craftwell blog! Tomorrow is a whole new eCraft project by Debi! I can’t wait to see it! I was taken completely by surprise when Andy released the newest BETA of Make the Cut. I decided to postpone the MTC video that I planned on and focus on this newest MTC and how it applies to the eCrafter. In this video, I go over how the new Custom Mat Size can be set up for us eCrafters. I also give you a brief tutorial on node editing! Yes node editing directly in MTC! WooHoo! This Beta can be downloaded HERE, please be sure to read all the notes on the beta before downloading. There is also a video there that goes into much more detail than I do, it is about 2 hours long, but certainly worth watching. I can finally share my secret!!! I have been selected to join the Design Team for the eCraft! Be sure to go over to the eCraft by Craftwell blog and see the announcement! While you are there, be sure to sign up to follow the blog so that you won't miss the other great designers and what they have for you too! We have some AMAZING projects lined up! The eCraft winner has been announced! CONGRATULATIONS to Ruthie! She won the eCraft Cutting Machine. See the announcement HERE! Raven has posted the preliminary winners for the eCraft Cutting Machine right HERE! The Grand Prize winner should be announced soon! Jessica, I will be e-mailing you shortly! I will be back when the Grand Prize winner of the eCraft has been announced! So sorry on the long delay in getting this video out. I am still trying to recover from this virus! This video comes at a request of Leanna on how to do welding in Sure Cuts A Lot 3. There actually are two different ways to weld and in this video I demonstrate both of them. I will be posting a Make the Cut video in a couple days, so stay tuned! 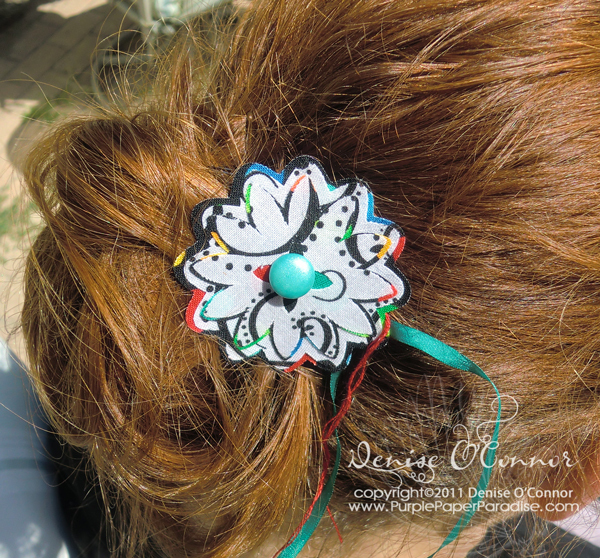 Welcome to the eCRAFT SEWING BLOG HOP! All of the fabulous designers on this hop are showing you a SEWING OR FABRIC THEMED project using the fabulous and versatile eCraft. If you just arrived here from Debi Tullier’s blog then you are in the right place. If you just happened upon my blog please start at the beginning over at Raven’s Blog. That way you will be able to see all of the amazing projects and you will have more ways to win. And boy do we have a great prize in store for you! More on that later...on with my project! Now, I have a confession...I am not very good at sewing. Just ask my 7th grade Home Economics teacher! I always joke that my sewing inabilities are a source of anguish to my mother, because she is a very talented and accomplished quilter. In fact, the only reason why I have a sewing machine is because my mother insisted that I needed it. She is not so thrilled that I use it only on paper...LOL! When I try to use it on fabric, it ends up looking like a garbled mess, but that did not stop me from tackling this challenge. Here is my project for the hop! Oh and please pardon my extremely messy hairdo! And thank you to my hubby for taking these pictures! Those flowers that you see where created entirely out of fabric! Cotton fabric (I use either scraps that my mother gave me or the quilting squares that you can get at most fabric stores) I used two coordinating fabrics for each, but you could use more if you like. eCraft cutting machine of course! The first thing that I did was apply the Heat N Bond Ultrahold to the back of the fabric with my iron. I then cut out all four of my flowers shapes with my eCraft. I did NOT remove the paper backing from the Heat N Bond before cutting and this is crucial in the next step. Once all the pieces are cut, it is now time to start layering the flower. Remove the paper backing from the top layer and place it on top of the second layer and then press with your iron. The paper backing should still be on the second layer, otherwise you will have a mess all over your ironing board! Proceed one layer at a time until you have all the pieces adhered to one another. You will need to keep your iron in place a little longer with each additional layer. The next step is to apply any additional embellishments. 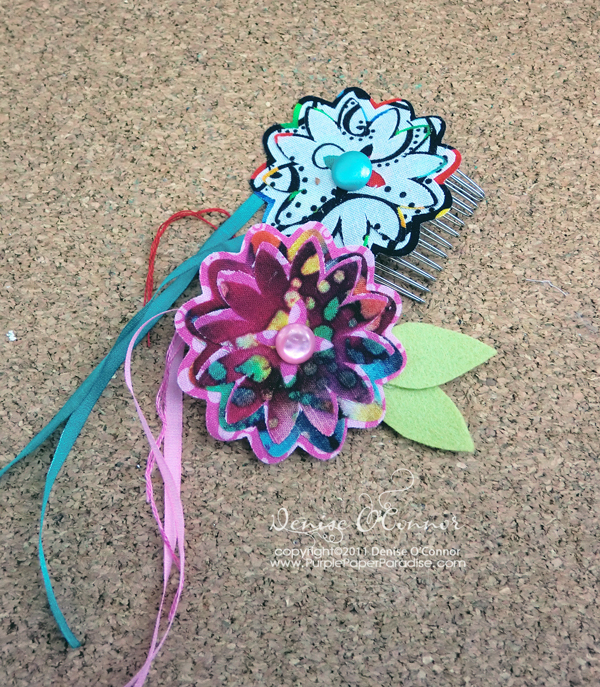 First off, remove the paper backing off the back of the flower. For my projects, what I did was punch a 3/16" hole in the middle of the flower. I then used one of my buttons that has the knob on the back. I pushed that knob through the hole. For one of these buttons, I needed to make the hole a little bigger so I just overlapped my hole punch slightly to make it just big enough. 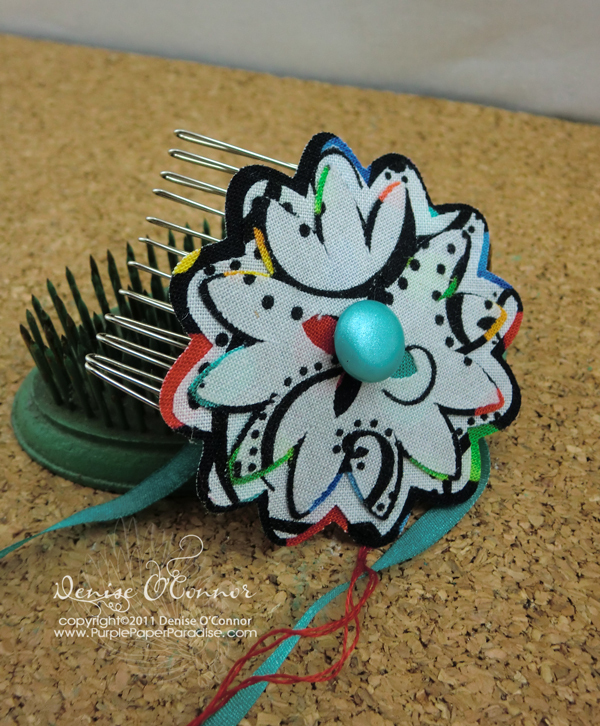 I then threaded some embroidery floss into a needle and inserted that needle into the hole of the knob on the back side of the flower. I then used my Copic marker to color my silk ribbon, but you could skip this step and just go with a ribbon that is already the color that you want. I think the thinner the ribbon you use the better for this. I laid my ribbon on top of the thread and tied the thread in a knot around the ribbon. I then also tied the ribbon in a knot to insure that it stayed in place. I purposely made the length of the ribbon on each side uneven as I think it is more interesting for this project. I also decided to leave the trailing ends of the embroidery floss hanging down. 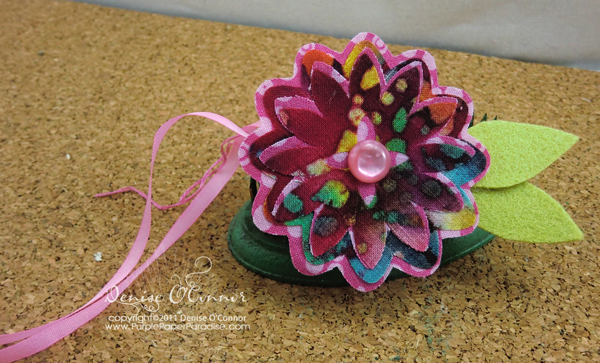 There are lots of possibilities here on what you can do to embellish the flower so have fun with it! Now, we are at the point where we need to heat up our hot glue guns. For the alligator clip (pink) one, I added a few green felt leaves (that I just quickly hand cut) to help cover up the clip. With that knob button it works best, if you position the knob in the "crook" of the barrette. I just glued in place and let it cool off. For the hair comb (black and white) one, there is a curve to the hair comb, so I glued one side in place, let that cool off, and then wrapped the flower around the opposite side and glued again. All in all, this project really did not take me long at all. I think these would be really cute for flower girls at a wedding especially if you made them in the wedding colors! DON'T STOP YET!!! We have some amazing prizes in store for you, so make sure that you follow the entire hop and enter to win on everyone's blog! Here is a list of all the designers in the hop in case you get lost along the way. Don't forget to check out the new eCraft blog and you MUST sign up to follow it to be eligible for the grand prize!!! Okay so you probably want to know what you can win, right? As some of you may have heard from this hop this amazing eCraft machine that we are all using is created by CraftwellUSA.com. This company is really amazing, their customer service is fabulous and the products are top notch. Well when they heard about our hop they decided to giveaway (1) One eCraft to (1) One lucky winner color may vary. Follow the instructions below to be entered in this giveaway, as well as another giveaway that I have planned for you! qualify per person additional comments will not count.) Your comment must be posted by 9AM EST on September 10th! 2.) Stop by eCraft’s facebook page to see more awesome projects and tutorials. Don't forget to "Like" their page while you are there! 3.) Become a follower of my blog...it's easy just click on the little button over there on the right hand side! (1) One lucky winner will be announced on Raven’s blog on in the evening on September 10th. The winner will also be listed on the eCraft Facebook page (see why it’s a good idea to like eCraft's facebook page ;). I will also post here when the winner has been announced as well as the winner of my other giveaway. All are welcome to hop, however the eCraft giveaway is only open to U.S. entries. Thank you so much for your understanding. In addition, I also have a little giveaway for you! If you have been following my blog, then you know that I am a mom of two boys. 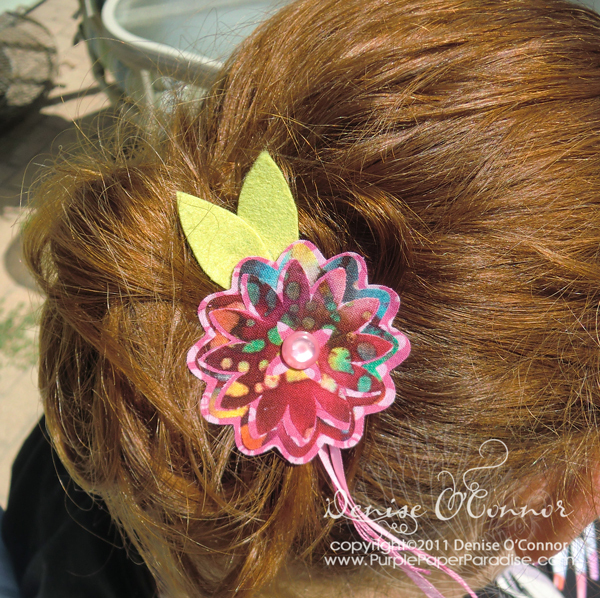 I know this is hard to believe, but boys don't like putting barrettes and things in their hair!! I know...shocking! So I am giving away my project today to one lucky winner! I am hoping that these find their way to a little girl who will love wearing them as much as I loved making them! Once you are done leaving your comments here, don't forget to head over to Erika's blog for even more chances to win! Good luck to everyone!